Science communication is all about presenting scientific information in a way which is accessible to all. It is an important part of the role of a scientist in today’s society. 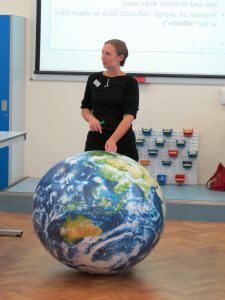 As a climate change scientist I am passionate about public engagement and outreach and regularly participate in discussions and presentations about climate science. I co-run a major science outreach and education project Swansea University Science for School’s Scheme (S4). Students participating in the s4 programme take part in summer schools, science taster days and workshops on Swansea University’s campus. S4 offers enhanced science education opportunities to students from backgrounds with a traditionally low level of participation in higher education and science education. In 2016 I also joined a team of colleagues at Swansea University who together opened the city’s Oriel Science centre. Oriel Science seeks to showcase Welsh science research in the community and offers a gallery space for hands on exhibitions, workshops, meetings and public science events. Oriel Science presented The Story of Time from September 2016 to June 2017 and closes for refurbishment on June 4th 2017. Welsh Women in Science panel for Oriel Science’s British Science Week Super Science Sunday. National Geographic Explorer article ‘Meet Swansea’s Tropical Tree Ring Explorer’. ‘Why you’re right to be worried about Wales’ weather’. Interview with WalesOnline. National Geographic ‘World’s Tallest Tree’. BBC Radio Wales Science Café on ‘Fake News’. Tue 2 May 2017, 18:30: The political arena isn’t the only place where fake news and “alternative facts” are being debated. Scientists are now speaking out about false information which they say is diluting and harming legitimate research. In Science Café this week, Adam talks to a group of Welsh scientists about the difficulties of working in what some have dubbed the “post-truth age”. Dr Ed Pope, a lecturer in Marine Biology at Swansea University, recently organised a public talk on the subject with his colleagues Professor Mary Gagen and Physics Prof Chris Allton. Together with Tom Crick, Prof of Computer Studies at Cardiff Metropolitan University, they explore the role of social media in circulating inadequate information and the worrying distrust of experts. All agree that a new way of presenting relevant scientific findings must be found. BBC Radio Wales: Professor Mary Gagen, Associate Professor in the Geography Department, Swansea University appeared on the BBC Radio Wales Wynne Evans programme this week. Dr Gagen was answering science questions from young listeners and talking about the Science4Schools scheme and the events at the Oriel Science gallery. BBC coverage of journal article about British summer weather. Warming unlikely to limit chances of UK soggy summers. WalesOnline coverage of journal article about European summer climate over the last 1000 years. Ephemeral Coast exhibition. Ephemeral Coast is a long-term research project with exhibitions currently planned for Mauritius (2015) and Alaska (2016) with further sites being investigated. A catalogue of Ephemeral Coast – S. W. Wales, will be available, with contributions by Ian Buchanan, Director of the Institute of Social Transformation, University of Wollongong, NSW, Australia; Mary H. Gagen, Associate Professor of Geography and Climate Change, University of Swansea, Wales; and Celina Jeffery. An Introduction to the Oriel Science exhibition centre: Showcasing Swansea University’s Science in the Community. BBC News and Noodls reports on new research by *Dr Mary Gagen and Professor Danny McCarroll that shows that summer temperatures are linked to random shifts in the Atlantic storm track. This morning’s BBC Radio Wales Good Morning Wales programme (07:16am) featured an interview with Associate Professor Mary Gagen, of the College of Science, as the Paris agreement on climate change comes into effect today, marking the first time that governments have agreed legally binding limits to global temperature rises. Ephemeral Coast by Celina Jeffery.